Carlingford is a picturesque medieval town on southern shore of Carlingford Lough in Co. Louth. The town still retains its medieval layout noticeable by the narrow lanes and small streets. Tholsel Street is where the last of the medieval walled town's gates can still be seen. King John's Castle was commissioned by Hugh de Lacy in the 12th century however the castle gets its name to King John who visited Carlingford in 1210. The castle was constructed over a period of 400 years with alterations and additions occurring in the 15th and 16th centuries. The Dominicans were established in Carlingford in 1305 primarily because of their patron Richard Óg de Burgh, 2nd Earl of Ulster, with the friary itself being dedicated to St. Malachy. Dissolved in 1540 by Henry VIII, it became the centre of a repossession struggle between the Dominicans and Franciscans in the 1670s. It was resolved in favour of the Dominicans by Oliver Plunkett. However, the friary itself was subsequently abandoned in the 18th century by the Dominicans to their present location of Dundalk. The remains today consist of a nave and chancel divided by a tower. Also, there are possible remains of some domestic buildings to the south like a mill, mill race and mill pond. The Town Wall was established by charter in 1326 by Edward II to the Bailiffs of Carlingford, it allowed them to levy a toll for the building of the walls. Not much remains however but the little that does has some externally splayed musket loops that would indicate the arrival of firearms to Ireland in the late 15th century. The Tholsel or "town-gate" was to levy taxes on goods entering the town. It was used as a town gaol in the 18th century. 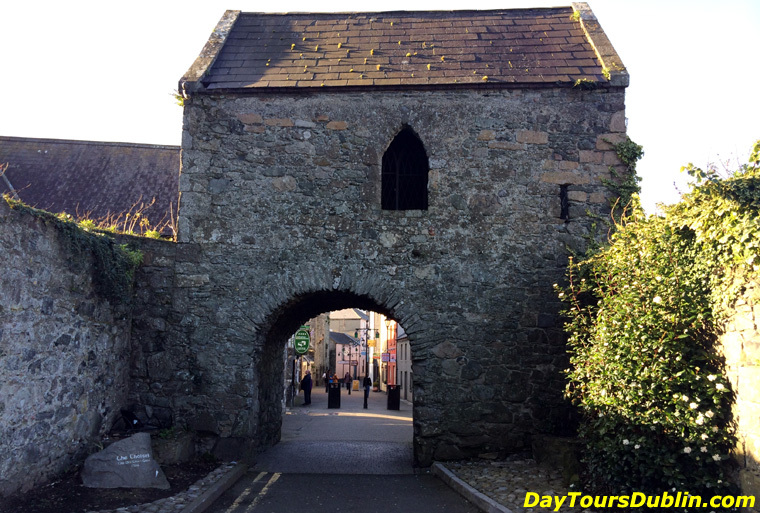 Taaffe's Castle also known at the Merchant House is a fortified town house that according to local tradition belonged to the rich mercantile Taaffe family who became Earls of Carlingford in 1661. The castles close proximity to the harbour would suggest a trading depot on the ground floor with the upper floors reserved for residence. The Mint is a fortified three-storey townhouse belonging to a wealthy merchant family in the centre of Carlingford. The most notable feature is the five highly decorated limestone windows. The patterns and motifs are an example of the influence of the Celtic Renaissance on art during the 16th century. Ghan House is a Georgian House built by William Stannus in 1727 it is surrounded by castellated walls and a guard tower. The first floor contains the drawing room which has a decorative ceiling of rococo plasterwork of flower garlands and medallion busts reputed to be of Stannus ladies. Today Ghan House is used as a guest house and cookery school. Now the main street of Carlingford, this was the area where a weekly market was held with records of its layout going back to 1358. It is now the intersection of Dundalk Street and the beginning of River Lane. Trip Advisor Review: Incredible Personalized Tour through the Boyne Valley. Michael is an incredible guide. My brother and father had taken a tour with him before my arrival in Ireland so we arranged for a tour for my other brother and myself a few days later. It was, hands down, the best day I had in Ireland. We started out the day with Newgrange and then traveled all over the Boyne Valley learning about the history of the area (which is a bit mindblowing!) He took us for lunch at Slane Castle, which was delicious, and got to try Slane Whiskey which is a real treat. I wanted to see Irish coastline so Michael took us to the beach where he went as a child. He was friendly, knowledgeable and tailored the entire trip to our requests. I cannot recommend Michael highly enough! Original Trip Advisor Review.